Okay, so I had to put some out-of-state hours on the airplane and I had gotten a little tired of the flight to Vegas. I checked the chart and decide to fly to Lake Havasu, just over the Arizona border. I worked out ahead of time for this to be my IFR cross-country flight. It was going to be a fun flight where I landed at three different airports with three different types of approaches and did at least 250nm in the plane. It was going to be an early morning sort of flight. Then the scheduling computer that Justice Aviation uses screwed up, and my flight instructor was booked during the time we would be returning, which meant that I couldn’t do it during the day. That bummed me out. I decided to just do a night flight instead, and it looked like I might be able to stop in Palm Springs to collect my friend Kramer who was finishing up at a recording studio there. The sky was clear over the house and the ATIS at Santa Monica was reporting MVFR (Minimums for Visual Flight Rules), but ten minutes after I arrived at the airport a fog bank moved that last half mile from the beach and the airport went IFR. Incredibly frustrating. Although I have the skills now to fly up through a thin layer of clouds, I have made myself a rule: no IFR without the IFR ticket. It’s a good rule, because a large swath of the pilot-error accidents are IFR flight without IFR rating (including Buddy Holly, Patsy Cline and Otis Redding). So it became my shortest ever IFR lesson, with Keiko from Proteus flying over to Van Nuys with me (she took a cab back to Santa Monica). It was a nice night to fly, if a little warm. There were a few clouds at twelve thousand feet and no moon yet. I flew over Big Bear, Twenty-nine Palms, and then the desert to get to the Arizona border. There were some stiff (twenty-five knot) headwinds at times and when gusts pushed against the plane they sometimes made the engine sound different. When I later mentioned to my online community of pilots that I was a little nervous flying at night over the desert (few possible landing spots, no lights down there) and the engine sometimes sounded funny an F-16 Air Force pilot wrote in, “My engine ALWAYS makes funny noises four hours into an ocean crossing.” That made me feel better. It was 9pm when I approached the airport. I had read up on the facility directory and the airport didn’t allow direct pattern entries or straight in approaches. I could see some of the lights of the town, and I could see the blackness of the lake. I picked out the beacon (rotating light alternating white and green light), and then the runway lights. It’s a CTAF (Common Traffic Advisory Frequency, no control tower) airport and there was no one on frequency. There was nothing but black ground and a deep grey sky. I could pick out a road. At night, lights on the road are difficult to gauge distance with. Some red obstacle lights are north of the airport. The town of Lake Havasu is south of the airport, but I am meant to do a right pattern for One Four in this calm wind, over the blackness of the undeveloped hills. 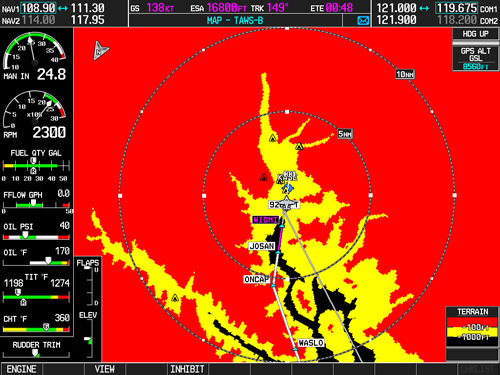 I had on the terrain shading on the G1000’s map display which means that things above or at my current altitude are red, and things below my altitude by less than a thousand feet are yellow. As I descended to pattern altitude everything turned yellow. I never keep it on when in the pattern at airports I know, so I didn’t know how normal it is to see that. After the lonely, featureless flight over the desert I sweated a little, picturing the NTSB CFIT (Controlled Flight Into Terrain) report. I did too tight a pattern, in close to the field. I stayed high. I knew even before turning base that there was no way I was going to land. I was way too high. Feh. I announced a go around, standard when you don’t like the looks of your landing. With the wind calm, I flew over the landing strip and toward the small, sleepy town. I sidled right into a left downwind for Three Two, the opposite runway. I extended the downwind a little and slowed down more. Calmer, with lights below me, I made a more standard left pattern for Three Two, and landed easily. There was absolutely no one else at the airport, which was well lit and appeared to have a real passenger terminal. I announced all of my taxiing and parked at the fuel pit. I ate some peanut M&Ms and drank some water in the hundred degree desert night. I wondered if I had been in the Cherokee without all my fancy glass cockpit geegaws if I just would have trusted the chart. The guidelines are very clear. You fly your pattern downwind (parallel to the runway) one mile from the runway. You fly past your point of touchdown by a mile, and then turn base, turning final as you line up with the centerline of the runway. If they say the pattern altitude is a thousand feet above the runway (they did) and there were no obstacles marked on the chart (there were not), then you are clear of terrain and obstacles flying a standard pattern. In the dark, it’s so difficult to trust that. I recently read that Philip Greenspun (one of my aviation mentors) treats night VFR flights as instrument flights and always flies an approach in to land. I could have done that, following a radio beacon into the field, dropping down to specific altitudes as I crossed certain points. That would have been smarter and the next time I am approaching a strange airport in the dark, that’s what I will do. I decided not to fly back over the empty desert to Twenty-nine Palms and home, instead flying north to Daggett and over the mountains into the Valley. Santa Monica was still IFR, so I had to land at Van Nuys and take a cab home at midnight. A long flight and not one of my favorites, but as the moon rose, some of the views of the desert and mountains were beautiful. I wish there were orange. I wish the resolution were higher. I wish there were a profile view. I wish I had Chelton’s Synthetic Vision.